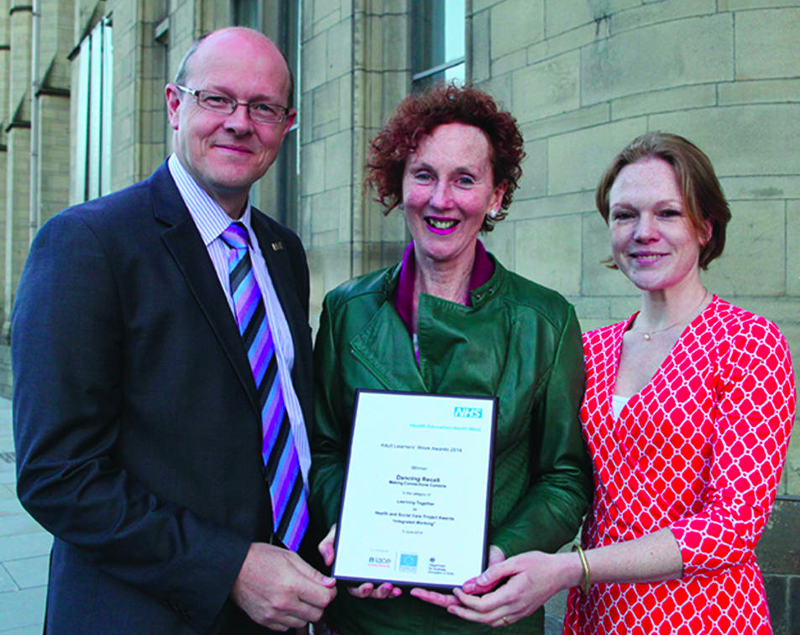 Receiving the award on behalf of the project were (left to right) Bruce Lawson, senior manager with Active Cumbria; Daphne Cushnie, project designer, mentor and practitioner; and Susie Tate, project mentor and practitioner. Cumbrian dance project Dancing Recall scooped the “Developing a Shared Culture Project” award at the Health Education North West Adult Learners’ Week awards ceremony in Manchester. The ceremony was held at Manchester Museum and was run in conjunction with Adult Learners’ Week. Receiving the award on behalf of the project were Daphne Cushnie, project designer, mentor and practitioner; Susie Tate, project mentor and practitioner; and Bruce Lawson, project manager with Active Cumbria. It uses a model founded on the values of community dance where relationship, creativity and community building are key, but seamlessly weaves in a logical structure based on clinical understanding. It simultaneously addresses the physical, cognitive, social and emotional effects commonly associated with dementia in a highly enjoyable and creative way. Receiving the award on behalf of the project were (left to right) Bruce Lawson, senior manager with Active Cumbria; Daphne Cushnie, project designer, mentor and practitioner; and Susie Tate, project mentor and practitioner. The project was devised as part of a cross sector partnership supporting the Cumbria Dementia Strategy Action Plan, and converges medicine and the arts. It has a trained team of specialist community dance practitioners who teach weekly music and dance sessions in locations throughout Cumbria. They also visit care homes. The response from the pilot phase of the project has been overwhelmingly positive with participants clamouring for more.